Ranger Kidwell-Ross, our webmaster and Editor of World Sweeper magazine, completed an intrepid 5-week sojourn in 2001 to bring us news of how pavement sweeping is done in other countries around the world. This travelogue won an APEX Award of Excellence in Online Journalism for 2002. This story continues the travelogue from Asia. Manly Beach, Australia; Can You Sweep a Beach? Ray Cook, just three months on the job as coordinator of cleansing for Manly Beach (a suburb of Sydney), has been handed a mission. Fortunately, it looks as though he's the right man for the job. I initially contacted Cook for information on what is, to me, a unique vehicle Manly uses to transport its small, Tennant-built sidewalk sweeper. Called a 'Razorback,' it's an Australian-made adaptation to a Volkswagen chassis with independent rear axles. 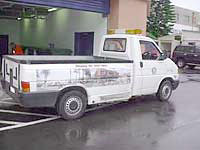 That's an important aspect of the vehicle, which has a bed similar to a pickup, because the entire bed drops down to the ground to allow the sweeper to be driven easily on and off its transport vehicle. 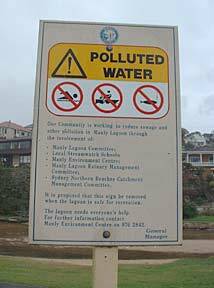 Once we finished talking about the Razorback, I quickly learned that Manly Council, the governing agency for the Manly Beach area, faces serious stormwater runoff pollution challenges. Bound on three sides by salt water, with an enormous wetland lagoon running down the middle of much of the city area's length, Manly has recently discovered polluted waterways in its surrounding ocean beaches as well as in the lagoon in the middle. The task ahead is daunting. "The industry in Manly is mostly upstream of the slough," said Cook. "And, most all of the pollution generated on the ground and coming off the vegetation ends up in either the lagoon or the ocean. We've had to post the lagoon to keep anyone from even letting their dog into the water, it's that bad. Recently, we had some type of industrial spill that came downstream and killed hundreds, perhaps thousands of fish in the lagoon. The surface was coated with dead fish; it was a terrible situation. We had to use big nets to scoop them up and dispose of them. Although we still don't know who was responsible, the investigation is ongoing and whoever was responsible will be facing stiff fines and possible jail time. For some time, we couldn't even allow people to walk near the lagoon. Now they can be near, but not in, it. "That was an accident that made our current situation even worse. We still have to solve our everyday problems, though. We're trying a variety of measures, including several that involve sweeping, to keep pollutants from entering our waterways. Unfortunately, our street level is virtually the same height as the lagoon, so the rotting leaves are really creating problems. We've recently acquired a Mad-Vac sweeper that we intend to use for vacuuming the leaves on Manly streets. We've just gotten it, so can't say how well it will do, but it did okay in the trials. "We also have an older American-Lincoln sweeper we use for all the walkway areas around the beaches. Although it doesn't recirculate all the water like newer types, it does put its water into a tank so it can be disposed of properly. We also use the Tennant sweeper/scrubber to clean sidewalk areas. That's the sweeper we transport with the Razorback. "We've also replaced our old Tymco-brand sweeper with a new Johnston 5000. Although we had a number of problems with it in the first couple of months after we received it, the dealer seems to have those pretty much fixed now. We expect that it will provide better pickup of the smaller debris that can get into the waterways most easily. A big factor for us in choosing a new sweeper was a high dump feature. We're outgrowing our storage facility, and no longer have room to dump debris for later transport. Plus, the old method leaves the material susceptible to runoff when it rains. "This is all a change for me, since I initially came from the construction industry. In construction, of course, everyone wants to build without worrying about restrictions and roadway cleanup and that sort of thing. They just want to get on with their project as quickly and inexpensively as possible. Now, I'm on the other side of the fence and I can see why keeping material from running off into our water is so important. Although I'm new on the job, we're working very hard to get a handle on this problem and make the improvements that are needed to fix it." Ray Cook struck me as a man who is earnest in his commitment to making a serious, positive impact on Manly Beach's pollution runoff problem. Although he understands that it won't be an easy challenge to overcome, Ray was knowledgeable about the situation Manly faces, and open to learning more. 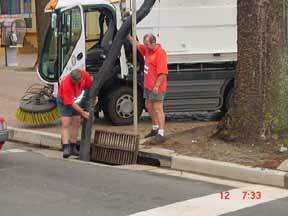 Cook also mused about another difficulty that looms in Manly Council's near future. "Currently, we dump here in our local area, but our landfill is projected to be full in just two-and-a-half years. Even if we find a way to double that timeframe, it won't be long until we have to make other arrangements. Unless there is a radical solution that happens in the meantime, we'll have to transport our debris over 200 km to dump it. That will cause a huge increase in our costs, over and above everything we're now doing." Manly Beach is an area of extraordinary natural beauty. Just a half-hour ferry ride from Circular Quay, Sydney's main ferry terminal, the beaches have an international reputation for quality and splendor. By all odds, however, Ray Cook and his crew are in a race against time to keep that reputation intact. Next, we'll travel north about 1,000 km to see how sweeping is done in an area near Brisbane called Caboolture Shire Council. Neil Claridge, a public works professional for over 40 years, will be our host, and will update us on how sweeping is done today in his Shire, as well as how it differs from years past.